CEBU CITY--With superstar Manny Pacquiao watching from ringside, Bert Batawang and Rodel Mayol stopped their Thai counterparts moments ago at the New Cebu Coliseum in the co-feature of the "Back on Track" card. 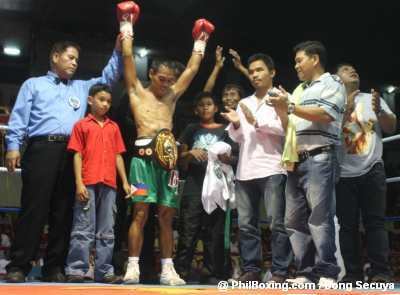 Batawang took the vacant WBO Oriental light flyweight title with a very impressive fourth-round, one-punch knockout over Samransak Singmanassak. The bout was fairly competitive in the first three rounds, but Batawang's power was clearly evident when he unleashed a good right to Singmanassak's kisser that sent the latter sprawled on the canvas. 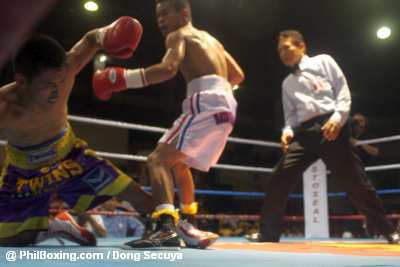 Referee Severino Necesario waved the fight off after Singmanassak staggered on his feet as he tried to get up. Mayol, with his new manager Pacquiao watching from ringside, toyed with the bigger Wisan Sor Suchanya and finally halted him in the fifth with a barrage of punches. Mayol earlier sent down Suchanya with a barrage in the second round, but the Thai visitor weathered the storm. Highly touted Cham 'Amlan Warrior' Sedillo crashes in his pro debut when he was outclassed by the wily Rosendo Navarez of Cagayan de Oro City. A lot of people who had hoped for a sterling performance by Sedillo owing to his terrific amateur record were disappointed as the Negrense, who showed some power, was clearly in need of a lot of polishing before he could compete in the pro ranks. - Eric Macas lost to veteran Pedro Malco by TKO in 7th when the ring physician advised the referee to stop the fight due to a cut on Macas' face that was caused by a legal blow. - Ryan Tampus knocked down twice in the first round and once in the second round Jerome Aguirre before the referee stopped the contest. 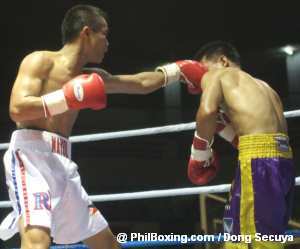 - In the evening's opening bout, Ariel Adan lost to Arnel Dunal by UD. With reports from Dong Secuya. 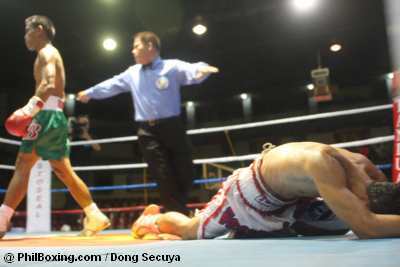 Mayol (R) sends Sunchanya to the canvas in the second round during their bout at the Cebu Coliseum Saturday night. Thailand's Singmanassak kisses the canvas as the referee signals Bert Batawang to go to a neutral corner in this bit of action from their fight Saturday night. 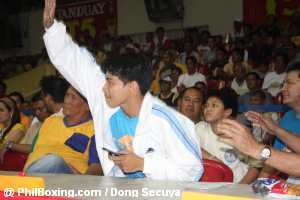 Batawang's hands are raised in victory after he knocked out Singmassak Saturday night at the Cebu Coliseum. With him are from left, referee Ben Necesario, his two kids, superstar Manny Pacquiao, former wolrd champion Dodie Boy Penalosa and Buboy Fernandez. Sedillo tries to get up after being knocked down by Navarez in the second round. Manny Pacquiao (R) with wife Jinkee stand in attention during the singing of the Philippine national anthem. IBF minimumweight champion Florante Condes acknowledges the crowd after he was being introduced during Saturday nights boxing event at the Cebu Coliseum in Cebu City.